JC Audiology is a premiere hearing health care provider for those with hearing loss. Our audiologist is skilled in the area of diagnostic procedures, hearing aid selection and provision, hearing aid satisfaction, assistive and alerting technology, hearing conservation, tinnitus management, and development of effective communication skills through aural rehabilitation. 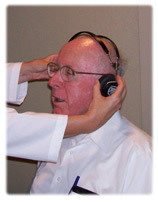 Comprehensive hearing tests with state-of-art equipment. Certified sound booth for accurate testing. Hearing aid prescription, hearing aid sales and electronic fitting, including digital technology. Hearing aid follow up, including adjustments and repairs. Counseling and hearing rehabilitation for patients and their families. Hearing loss prevention education and tinnitus management. Assistive listening devices for television, telephone, and public areas. Swim molds, ear molds, and noise protection earplugs for those working and playing in high noise environments. Specialized hearing protection ear inserts for dentists and musicians. Dr. Reese is Medicare approved and accepts insurance. We accept major credit cards, personal checks, and cash. Other payments plans are also available.